Wherever you are on your spiritual journey, you are welcome here. Whether you are passing through or this is the beginning of a longer relationship, welcome. You are today part of our family. On this day we begin each service with the Liturgy of the Palms outdoors (weather permitting). We’ll ask God to bless the branches of palm and then we’ll wave them and shout “Hosanna” as we recall Jesus’ triumphal entry into Jerusalem. The tone changes as we hear a dramatic reading of the entire passion gospel taking us through the events of Jesus’ arrest, trial, and death on the cross. And so we begin the journey to the cross. We begin this evening with an Agape Meal, a shared feast of love. Bring your offering of bread, cheese, fruit, or olives and wine or grape juice. We’ll gather in the hallway and feast together. Our service places Jesus’ Last Supper in its context as a Passover meal. We’ll talk through the steps of the seder, noting at which points Jesus gave new meaning to the bread and wine. And we’ll share the Eucharist just as Jesus’ original disciples did that night. As the meal ends, we’ll remember Jesus’ arrest and torment by stripping the altar. 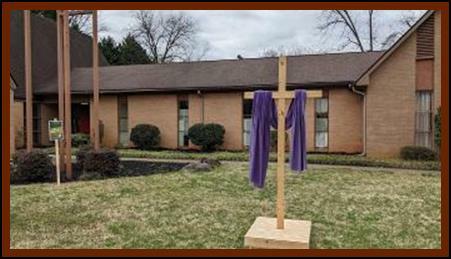 We’ll gather at Incarnation with our brothers and sisters from Limestone Presbyterian, Buford Street United Methodist, and St. Paul’s Lutheran to mark the day of Jesus’ death. We’ll hear John’s version of the passion gospel, pray together about our complicity in Jesus’ death, and make our devotions at his cross. Tenebrae is the Service of Shadows. We’ll hear readings and meditations based on the Seven Last Words Jesus uttered from the cross. With each word, the light of Christ will be snuffed and another nail driven into the cross. After the final word, there will be time for each of us to come make our devotions at the cross, either by praying silently or by driving another nail in. The service ends in silence. We’ll celebrate Christ’s resurrection in one glorious service all together. There will be sweet-smelling lilies, floating banners, bells to ring out on the “Alleluias,” and a fun, interactive sermon. Afterward we’ll share a covered dish brunch together, so be sure to bring something to share. And while the adults linger over dessert, the children will run around the playground hunting for Easter eggs. Be sure to bring your child’s Easter basket to hold their loot!